In 1990, Bruce Pannier first went to Central Asia — what was it like and what’s changed since then? Bruce Pannier is one of the most experienced journalists working on Central Asia. Having first traveled to the region in 1990, Pannier now works at RFE/RL authoring the Qishloq Ovozi blog. In this interview, Pannier shares some of his earliest experiences as a student and his perspective on journalism in the region. Of course, we also discussed some of the latest developments in Kazakhstan and Uzbekistan. 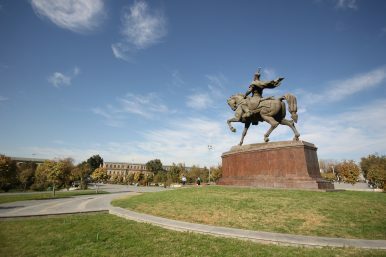 When was the first time you went to Central Asia? What was the big news at the time and what were your impressions of the region? The first time I went to Central Asia was summer 1990, to attend Tashkent State University in the Soviet republic of Uzbekistan. I was studying Uzbek language. I remember finding a driver at the Tashkent airport to take me to my dormitory at Tashkent State. We were delayed getting to the university by an obstinate cow lying in the road. My first ride in Central Asia. The biggest news event I remember at the time was the Osh riots of 1990. In Tashkent, at the university at least, we did not hear much about it. I did not have access to a television so most of my information came from the newspapers – Pravda Vostoka mainly. Local students, those from Central Asia, including Kyrgyz, listened to the radio or watched television news at the homes of family or friends. They told me some things. Soviet news made it sound like an unfortunate incident created by some local hotheads. We all knew Soviet troops had been sent and deployed around the area, so it was clearly more than an isolated incident. But we did not know how bad it had been. It wasn’t until I traveled to the Osh area in 1992 that I started to hear more detailed versions of what happened. There was something else that was happening in the summer of 1990, an undercurrent, the sensation everyone had that change was coming. Glasnost was in full swing. New parties and movements were being created and becoming active. Someone gave me a copy of a new newspaper, Islom Nuri (The Ray of the Light of Islam), with some basic information about the religion and how to live a religious life in the USSR. I had taken a bottle of Wild Turkey 101 with me, for medical purposes of course, but it proved a wonderful icebreaker my first days at Tashkent State. I would meet in the quad with local students in the evening, pass the bottle around (replaced later with local spirits), and we would talk about life in America and Central Asia. I remember the Central Asian students told me the USSR was going to be a more democratic country (I don’t remember anyone predicting the Soviet Union would fall apart one year later). They had little idea what exactly democracy was, and I couldn’t help them much with my explanations. They unfortunately equated democracy with materialism, so they said, for example, once democratic reforms took hold they would have cars and VCR players. I tried to explain that it was impossible to simply vote for or declare democracy. The United States had been working at it for more than 200 years and it was still a work in progress. My friends in the quad tended to brush this aside. In their minds, these young people already had a conception of their future that was much brighter, full of far more possibilities than the lives their parents and grandparents had lived. As for my impressions, I was somewhat in awe at being there finally. Central Asia had long been a difficult place to reach for various reasons. I had been studying the place for several years and watched the occasional documentary film about the region on Soviet television at the Harriman Institute. Being there was a bit different than I expected. Uzbekistan was part of the Soviet Union, but it was much more laid back than Moscow or Leningrad. People spoke a bit more freely. One of the main topics during the evening quad sessions was that the Soviet Union had taken much from Central Asia and not given much in return. The feelings of common exploitation by the Kremlin was a strand that tied all the Central Asians at Tashkent State together. I guess because I was American everyone assumed I would be sympathetic to anti-Russian conversations. And of course, Samarkand and Bukhara were wonderful to visit for the first time. The famous monuments were not well preserved then. Gur-i Emir, for example, was hidden behind buildings and under renovation. It was sheer chance that I found it at all, even though it was practically right across the street from the Intourist Hotel. Much has changed since then, but what hasn’t? Put another way: What aspects of Central Asia’s Soviet past remain relevant in these societies today? With the possible exception of Kyrgyzstan, there is still the feeling that the government and the people are separate. Those in the government have privileges that the average citizen does not enjoy. Elections remain perfunctory events. People think the outcome of elections is preplanned and their vote means nothing. The security service, whether the SNB, SGB, MNG, KNG, or GKNB remains a feared institution. No one wants to attract the attention of the security apparatus because everyone believes they have no hope if security agents detain them. If they are lucky, they pay bribes. If they are unlucky, they could be tortured into confessing to crimes they have not committed and then spend years in prison. No one thinks the justice system is their friend. Journalism isn’t easy when it comes to Central Asia and there’s a rather steady march of bad news over the years — detentions of journalists, restrictive laws, and so on. Are there any areas that give you hope for journalism in Central Asia? Actually, there is something that gives me great hope for journalism in Central Asia. Despite repeated crackdowns and tightening of media rules, there are still many journalists who show they are not cowed by the authorities. They continue to write critical articles knowing they could face retaliation from the government or friends of those in power. Uzbekistan since the death of first President Islam Karimov is also encouraging. The authorities loosened the hold over media a bit, and local journalists went right after important stories that they could not have touched when Karimov was in power. There are still many topics that are off limits, but I was impressed at how quickly journalists in Uzbekistan moved to stake out the new boundaries for media coverage. Something like flowers that bloom in the desert when the rains suddenly return. We also saw in the case of Tajik activist and journalist Hayrullo Mirsaidov that grassroots public pressure, mostly on Twitter, from outside a country can pressure local authorities into altering unjust decisions. In the time you’ve watched Central Asia, the media’s tools have evolved immensely. How have new and changing tools of the trade transformed the work of journalism in and on Central Asia? Mobile phones and apps have opened up new possibilities for relaying information. It seems to me, we are receiving more information from places like Turkmenistan and Uzbekistan than we did in the 1990s and the first years after the new century, and that is due to new technologies. Ordinary citizens are playing an increasing role in coverage, the so-called “citizen journalist.” They send photos and video clips they record on their phones to RFE/RL and other media outlets. They also share their own stories via WhatsApp, for example. This has led to the fall of many abusive officials in recent years and some small changes in policies. And every time there is a success, the number of people willing to similarly engage in such transfers of information increases. Obviously, the governments of the region are looking for ways to counter these connections but fortunately, so far technological advances are outpacing countermeasures. On to recent regional news: Kazakhstan has developed considerably since independence, but recent domestic developments — for example, the tragic death of five children in a fire in Astana while their parents were out working night shifts — exposed the fact that that development has been uneven and unequal. Is there growing awareness in Kazakh society of these inequalities? If so, do you think it will have consequences for the state’s elites? Kazakhstan is a unique case in Central Asia. In the early 1990s, Kazakhstan was just as bad off as the other Central Asian states, possibly worse off than some. Anyone at that time who was a young adult or older will remember those hard times (people were turning their balconies into fireplaces for heat in the winter) and many can look around and see there has been significant improvement in many regions of the country, in terms of infrastructure and living standards. For those who were children in the 1990s or were born later, the changes are probably not so perceptible. The situation was improving in the first decade of the 21st century. Kazakhstan’s government was able to honestly claim that things were getting better and would continue to do so. But the standard of living started tapering off by the middle part of this decade. There was the rough period of late 2015 until the start of 2017 when the situation became noticeably worse – the tenge devaluation and the knock-on effects it brought to many households in Kazakhstan. This is what the under-35 crowd remembers. Suddenly the situation was obviously worse. I think it made many people reassess what the standard of living could and should be in Kazakhstan. The lifestyles of some of the leaders of the country and the wealthy business elite now seem further and further out of the reach for the average citizen. There is already some grumbling about inequality as we see, and I think this will continue and grow stronger unless the authorities take steps to improve working conditions, social benefits, and ensure the creation of a solid middle class that does not have to worry about going deep into debt to buy a car or a house. The rights of workers also need to be addressed and the pressure the government has put on independent trade unions is not helping. That needs to be fixed also. People have been enduring this while the first president is in office, but Nazarbayev’s successor might not be able to count on the patience of Kazakhstan’s people. Turning to Uzbekistan. The recent news that Gulnara Karimova, the daughter of Islam Karimov, was being charged with conspiracy to commit money laundering in the United States surprised me. Did it surprise you? Beyond that, what do you think will happen next? For me, watching Gulnara’s career has been like going to a demolition derby. You just knew there was a wreck coming. Even when she was gallivanting around, stories of illegal or unethical practices followed her. I remember she was supposed to go to an event at the Cannes Film Festival that was a charity event for HIV/AIDS. That was just after an HIV/AIDs activist in Uzbekistan had been jailed for distributing leaflets promoting greater awareness of the illness. There was a substantial public outcry against Gulnara attending, but she did not seem to understand the message from these criticisms. She continued flaunting her wealth and fabulous lifestyle and reached the point where she felt invulnerable, strong enough to criticize people like Rustam Inoyatov, the head of Uzbekistan’s National Security Service (SNB). The more she had, the more she wanted, and it always seemed to me it would end pretty much like it has ended. So long as current President Shavkat Mirziyoyev is alive, certainly as long as he is president, Gulnara is likely to continue languishing in captivity. She knows too much about what Mirziyoyev was doing when he was prime minister from 2003-2016, and not only Mirziyoyev. Gulnara undoubtedly knows about the escapades and questionable financial dealings of other top officials and successful business people. With so many people having so much to lose by allowing Gulnara to walk free and start posting on social networks, I think she will spend at least the next decade or two confined somewhere.